Department of Pharmacy 1, BRAC University, Dhaka, Bangladesh. Department of Pharmacy 2, University of Asia Pacific, Dhaka, Bangladesh. Department of Pharmacy 3, Jahangirnagar University, Savar, Dhaka, Bangladesh. ABSTRACT: Polygonum viscosum, belonging to the family Polygonaceae, is an annual herb which is highly distributed in Bangladesh, China, Nepal, Japan, and India. Like any other plant of the genus Polygonum, P. viscosum is significant from both phytochemical and pharmacological properties. Findings regarding the use of this plant in pain, fever, tumor, infection, inflammation, blood clots and so forth mark it as a valuable and noteworthy plant. According to our knowledge, there are very few studies presently available that document all the biological activities of P. viscosum. Hence, the following review gives a critical assessment of the literature to date and is the first review on the mentioned plant combining the limited research data found on Polygonum viscosum. INTRODUCTION: Plants have been used as the traditional source of raw materials for medicines since the beginning of civilization of mankind. According to the World Health Organization, over 80% of the world’s population (about 4.3 billion people) is reliant on traditional plant-based systems of medicine for their primary health care. In this regard, it is found that plants and their products possess several pharmacological activities including analgesic, anticancer, anti-diabetic, immunomodulation, nervous system activation, antipyretic, hepato- protection, etc. 1 A large number of plants of medicinal importance have been explored by the scientists and researchers for the treatment of various ailments 2. Most of the medicinal plants have specific compounds which are effective in the treatment or prevention of diseases. Regarding this medicinal plants have also been a reliable source for preparation of new drugs. In the present era, researchers are more dependent on medicinal plants for the discovery of new drugs with fewer side effects 3. Numerous species of genus Polygonum are utilized in traditional medicine therapy and reported to contain various pharmacological properties. Furthermore, a potential medicinal plant under the family Polygonaceae is Polygonum viscosum. It is also known as “Sobuj Bishkatali” in Bengali and found widely in Nepal, China, Bangladesh, Japan and northeast part of India 4. 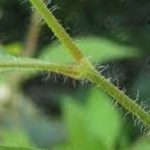 Parts of this plant is known to be traditionally used for the treatment of diseases as such fever, inflammation, tumors, pain, infections, cancer and so on 5. Conferring to the knowledge up to this day, there are very limited studies available at the moment about the biological activities of P. viscosum 6. The present study is an attempt to compile an up-to-date and comprehensive review of the plant Polygonum viscosum that mainly concentrates on its phytochemistry and pharmacological uses. Synonyms: Persicaria kuekenthalii H. Lév., Persicaria viscosa (Buch.-Ham. ex D. Don) H. Gross ex Nakai, Polygonum kuekenthalii H. Lév., Polygonum viscosum var. minus Hook. F.
Vernacular Names: Bengali: Sobuj Bishkatali; Chinese: Xiang liao. Botanical Description: Polygonum viscosum is an annual herb. 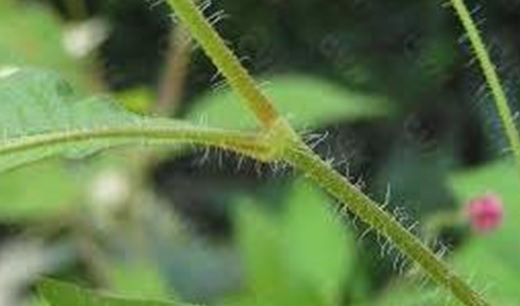 Its stems are erect or ascending, 50-90 cm tall, much branched, densely hirsute and glandular hairy. The petiole is short or nearly absent; leaf blade ovate-lanceolate or elliptical-lanceolate, 5-15 × 2-4 cm, both surface hispid, densely so along veins, margin entire, densely shortly ciliate. It has long, ochrea ciliate, tubular, 1-1.2 cm, membranous. Polygonum viscosum has inflorescence terminal or axillary, spicate, 2-4 cm; peduncle densely hirsute and glandular hairy; bracts funnel-shaped. The perianth is pinkish, 5-parted; tepals, elliptic, 3mm. Stamens 8, included. Styles 3, connate to below middle. This plants nuts included in persistent perianth, black-brown, shiny, trigonous, 2.5 mm. Polygonum viscosum is widely distributed in Northeast India, Bangladesh, and Japan. It is indigenous to Nepal. It occurs in various habitats; found in the mountains, along roadside, riversides and paddy fields 7. Chemical Constituents: Polygonum Viscosum has been reported to have many chemical constituents isolated from them. It includes sequiterpenes, viscoazucine, viscoazusone, viscozulenic acid, viscoazulone, viscozulenic acid methyl ester, viscosumic acid and polygosumic acid and flavonoids, viscoazucinic acid, 3’, 5-dihydroxy -3, 4’, 5’, 7- tetramethoxy-flavone, quercetin -3 -O -(6” -feruloyl) -β -D-galacto-pyranoside, quercetin -3 -O -(6” -galloyl) -β -D-galactopyranoside and 3’, 5’ 7-trihydroxy-3, 4’, 5’-trimethoxyflavone, quercetin -3 -O -(6”-caffeoyl)-β-D galactopyranoside 8-12. 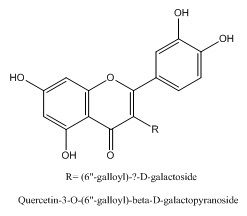 Quercetin 3-O-(6”-galloyl) -β -D -galactoside from Polygonum viscosum (Polygonaceae) 13. Moreover, phytochemical evaluation of chloroform extract of roots of P. viscosum has yielded six compounds which were isolated for the first time from Polygonum viscosum. 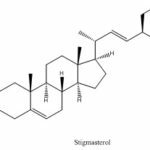 These compounds are stigmasterol, 7, 4 dimethyl quercetin, kaempferol, quercetin, myricetin, and scutellarin. The characterization of these compounds is done by spectroscopic methods and chemical analysis 14. 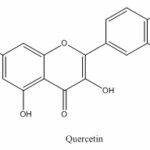 Anticholinergic Activity: Datta and his colleagues found that isolated compound quercetin 3-O-(6-feruloyl)-β-D- from the aerial parts of Polygonum viscosum indicated mild anti-cholinergic activity. This study was used to investigate the effect of test compounds on stomach muscle by taking acetylcholine as the spasmogen from guinea pigs the tissues were isolated, prepared accordingly the method described by Blattner et al., (1978). The tissue strips had been allowed to stabilize for 30 min before any compounds were added. On a UGO Basile model GEMINI 7070 2-channel polygraph contractions and relaxations were measured isometrically and displayed by Using force displacement transducer (UGO Basile, Italy). Spasmogen was applied to the tissue at 8 min intervals until constant responses were obtained 9. Anti-oxidant Activity: P. viscosum has moderate antioxidant activity. Moghal et al., (2014) found this plant as a good source of total phenolic contents because of crude methanolic, pet. ether, carbon tetra chloride, and chloroform extract showed total phenolic contents of 12.35 μg of GAE/mg, 11.4 μg of GAE/mg, 19.83 μg of GAE/ mg and 21.55 μg of GAE/mg extracts respectively. 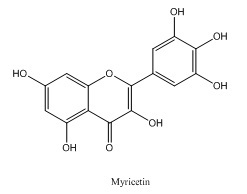 Polyphenolic compounds such as tannins and flavonoids are present in this plant that yield antioxidant property. It was also found that antioxidant activities of different extracts of the leaves of P. viscosum increase with increasing concentrations 6. Anthelmintic Activity: Majumder et al., (2014) found in a study that the extracts of Polygonum viscosum leaves possess significant anthelmintic activity in dose-dependent manner and the activity of the crude extract was equivalent with that of standard drugs. For this purpose, earthworms were tested with methanolic extracts of leaves of the plant followed by the determination of the paralysis and death of worms. On a note, adult earthworms were used to study the anthelmintic activity because they resemble with the intestinal roundworm parasites of a human being anatomically and physiologically and because of their easy availability 2. Anti-HIV Activity: Extracts of P. viscosum have anti-HIV effect. By using the reverse transcriptase assay the NCI Cancer Research and Development Center, Frederick, Maryland, USA evaluated the in-vitro anti-HIV-1 activity inhibitory activity against recombinant HIV-1 reverse transcriptase were tested by viscoazulone and quercetin, which was prepared and assayed following the method described by Kashman et al., (1992) with certain modifications. Buffer contained 50 mM tris, pH 7.8, 0.15 mg/mL dithiothreitol (DTT) and 0.1% triton X-100, virus disruption buffer (VBD) test compounds were diluted. Serial dilutions of compounds were added in the individual well of a 96-well V-bottom plate. In VDB recombinant enzyme was diluted and added to appropriate wells (50 mL/well). Only VDB received by RT control wells. Aliquotes of 10 ml from each well were added to 30 ml of cocktail containing 2 ml of 1 mM tris, pH 7.8, 1 ml of 3 MKCL, 5 ml of 3 mg/mL DTI, 5 ml of 0.1 M magnesium acetate, 10 ml of poly (rA)-p(dT)50(2 units/mL), 6.5 ml of distilled water, 0.5 ml of 10% triton X-100 and 10 ml of [3H] dTTP (16.56 Ci/mmol). Onto DE81 ion-exchange paper samples were harvested, incubated for 30 min at 37 degree Celsius and absorbed with distilled water. Pads were counted in a liquid scintillation counter after drying 5. 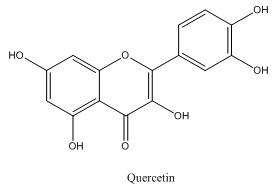 Viscoazulone and quercetin exhibited significant anti-HIV-1 activity with IC50 values of 33.13 and 25.61 mg/mL, respectively 9. 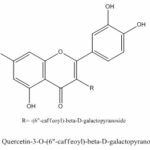 Analgesic Activity: Researchers reported analgesic activity of 4 sesquiterpenes, viscosumic acid, viscozulenic acid, viscoazucine and viscoazulone, and a flavonoid glycoside, quercetin-3-O -(6''-feruloyl)- beta -D -galactopyranoside isolated from the aerial parts of P. viscosum (Polygonaceae). Pain relieving action of the isolated compounds was contemplated as a proportion of pain perception time in response to thermal stimuli. All isolated compounds, aside from viscoazulone, indicated measurably significant (P<0.01) pain relieving action in contrast with that of the positive control morphine. Among these compounds, viscozulenic corrosive was found to have moderate pain relieving action, while viscosumic acid, viscoazucine, and quercetin 3-O-(6-feruloyl)- β-d-galactopyranoside indicated mild pain relieving movement 14. Thrombolytic Activity: Thrombosis is a physical process of developing thrombus or blood clots in the human circulatory system. It can lead to heart attack, strokes, and other coronary conditions. As a result, anticoagulation therapy and thrombolytic agents or drugs are essential for the management of thrombosis patients. Apart from commonly used drugs for this purpose, some medicinal plants such as P. viscosum have been found to have significant thrombolytic properties by Moghal et al., 2014. A study showed that after treatments of a blood clot with 100 microliters of crude methanolic extract, petroleum ether extract of P. viscosum in the concentration of 20, 10, 5 mg/mL showed varying clot lysis, i.e., 12.49, 9.54, 6.69% and 17.07, 13.81, 7.92% respectively. This concluded that the extracts of this plant have significant thrombolytic activity compared to negative control. 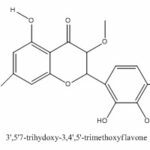 The thrombolytic activity can be an outcome of the fact that the extracts are good sources of alkaloids, tannins, flavonoids, and terpenoids which are believed to exert clot lysis 6. CNS Depressant Activity: Datta and his colleagues found that viscoazucine and viscoazulone (Isolated from Polygonum viscosum) exhibited significant CNS depressant activity which was evident from a gradual decrease in movement of the treated mice. The decrease in movement with time after administration of the other test compounds i.e. 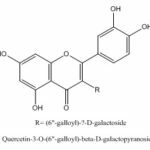 viscosumic acid, viscozulenic acid and a flavonoid glycoside, quercetin-3-O- (6-feruloyl)-β-D-galactopyranoside indicated moderate CNS depressant activity of viscosumic acid and quercetin-3-O- (6-feruloyl)-β-D-galactopyranoside, and mild activity of viscozu-lenic acid at a dose of 50 mg/kg body weight 14. Anti-bacterial Effect: Three new sesquiterpenes viscozulenic acid methyl ester, viscoazucinic acid, and polygosumic acid have been isolated from the chloroform extract of the aerial parts of Polygonum viscosum by reversed-phase preparative HPLC. Among these compounds, polygosumic acid is the most active and displayed antibacterial activity against different bacteria like Bacillus cereus, Citrobacter freundii, Escherichia coli, penicillin-resistant Escherichia coli, Klebsiella aerogenes, Pseudomonas aeruginosa, Staphylococcus aureus. The most noteworthy activity of polygosumic acid was against methicillin-resistant S. aureus, and the most potent activities were found against penicillin-resistant E. coli and S. aureus. 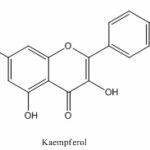 Both viscozulenic acid methyl ester and viscoazucinic acid inhibit the growth of Bacillus cereus, Klebsiella aerogenes, Lactobacillus plantarum, Pseudomonas aeruginosa and Staphylococcus aureus due to their structural similarity 8. Anti-inflammatory Activity: P. viscosum extracts possessed moderate anti-inflammatory activity on raw paw edema induced by carrageenan. Anti-inflammatory activity on a moderate scale was observed. The extracts of Polygonum viscosum showed this activity on raw paw edema induced by carrageenan. Viscosumic acid, viscozulenic acid, viscoazucine, and viscoazulone, and a flavonoid glycoside, quercetin -3 -O- (600-feruloyl) -b -d-galactopyranoside isolated from the aerial parts of this plant were tested for this activity. Among them, viscozulenic acid showed mild to moderate anti-inflammatory activity, viscosumic acid and viscoazulone showed mild anti-inflammatory activity. However, viscoazucine and quercetin-3-O- (600-feruloyl)-b-d-galactopyranoside did not exhibit any significant effect on carrageenan-induced paw inflammation 9. Cytotoxic Activity: The flavonoid glycoside from the aerial parts of the Polygonum viscosum exhibited cytotoxic activity against ovarian cancer cell line (OVCAR-3) while in-vitro cytotoxic assays were performed 9. Anti-tumor Activity: Ethyl acetate fraction of Polygonum viscosum leaves exhibited remarkable antitumor activity. Polygonum viscosum showed a significant decrease in tumor volume, packed cell volume and viable cell count and increased the life span of Ehrlich ascites carcinoma bearing mice 16. CONCLUSION: This review illustrates a detailed description of Polygonum viscosum and its significance. This is one of the traditional medicinal plants on which numerous researches had been conducted. We can be benefitted from this plant to a great extent as it possesses important pharmacological activities. ACKNOWLEDGEMENT: Authors are grateful to Jahangirnagar University, Department of Pharmacy, Savar, Dhaka, Bangladesh for providing necessary facility to carry out the study. CONFLICT OF INTEREST: Authors declare no conflict of interest. AUTHOR'S CONTRIBUTION: The review was conducted under the supervision of Pritesh Ranjan Dash (PRD) who also designed the study. The introduction was done by a collaboration of Safiqa Hossain (SH) and Anika Mahmood (AM). Serially, synonyms were retrieved by Zeba Raisa (ZR) along with AM, vernacular names and taxonomical classification were searched and collected from the internet by AM. The botanical description was written by SH while the figures of the plant were founded by Nasib Bin Mahbub (NBM). Next, the chemical constituents were explored by ZR while the structures for them were done by NBM with the use of ChemDraw. 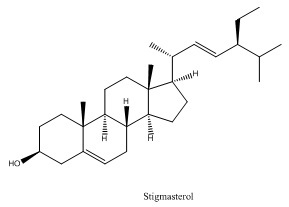 In the next part, which is medicinal properties of Polygonum viscosum, AM contributed in the anti-oxidant, anthelmintic and thrombolytic activity; NBM contributed in the anti-tumor and anti-bacterial activities; SH contributed in the anticholinergic, anti-HIV activity, analgesic, and CNS depressant activity and ZR contributed in the anti-inflammatory activity and cytotoxic activity. All authors read and approved the final manuscript. Singh S and Sedha S: (Medicinal plants and their pharmacological aspects. FPI 2018; 1(4): 156-170. Majumder MS, Amin MN, Moghal MMR, Banik S, Kar A and Hossain MM: Anthelmintic and cytotoxic activities of two medicinal plants: Polygonum viscosum and Aphanamixis polystachya growing in Bangladesh. Journal of Scientific Research 2014; 6(2): 339-345. 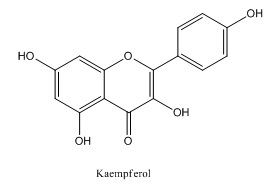 Rafieian-Kopaei M: Medicinal plants and human J Herb Med Pharmacol 2012; 1(1): 1-2. 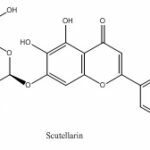 Datta BK, Rashid MA, Datta SK and Sarker SD: Viscozulenic acid : A novel sesquiterpene acid from viscosum. Pharmaceutical Biology 2001; 39(3): 198-201. 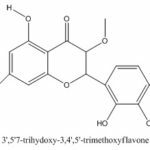 Datta BK, Iasmin T and Rashid MA: Further flavonoids from Polygonum viscosum Buch-Ham. Dhaka University Journal of Pharmaceutical Sciences 2016; 15(1): 27-30. Moghal MR, Majumder MS, Amin MN, Banik S, Ibrahim M, Jitu KMRM, Mukul MEH, and Das RC: Screening of biochemical activities of a potential medicinal herb growing in Bangladesh. World Journal of Pharmaceutical Research 2014; 3(10): 204-217. Kantachot C and Chantaranothai P: Achene Morphology of Polygonum s.l. (Polygonaceae) In Tropical Natural History 2011; 11(1): 21-28. 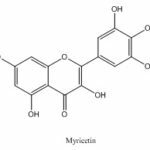 Datta B, Rahman M, Gray AN, Hossein S and Sarker S: Polygosumic acid, a new cadinene sesquiterpene from Polygonum viscosum, inhibits the growth of drug-resistant Escherichia coli and Staphylococcus aureus (MRSA) in-vitro. J Nat Med 2007; 61: 391-396. Datta B, Datta S, Kahn T, Kundu J, Rashid M, Nahar L and Sarker S: Anti-cholinergic, cytotoxic and anti-HIV-1 activities of sesquiterpenes and a flavonoid glycoside from the aerial parts of Polygonum viscosum. Pharmaceutical Biology 2004; 42(1): 18-23. Datta B, Datta S, Chowdhury M, Khan T, Kundu J, and Rushid M: Analgesic, anti-inflammatory and CNS depressant activities of sesquiterpenes and a flavonoid glycoside from Polygonum viscosum. Pharmazie 2004; 59(3): 222-5. Datta B, Rashid M, Kundu J, Rouf A, Sarker S and Datta S: (Isolation and structure elucidation of viscoazucine, a novel sesquiterpene from viscosum. Pharmazie 2001; 56(7): 578-579. 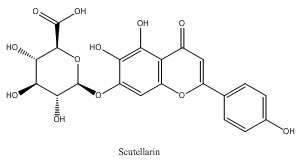 Datta B, Datta S, Rashid M, Nash R and Sarker S: A sesquiterpene acid and flavonoids from Polygonum viscosum. 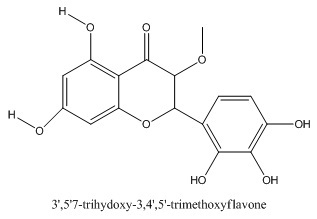 Phytochemistry 2000; 54(2): 201-5. 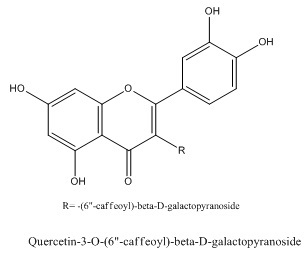 Datta B, Datta S and Sarker S: Quercetin 3-O-(6”-galloyl)-β -D -galactoside from viscosum (Polygonaceae). Biochem Sys Ecol 2000. 28(8): 805-807. 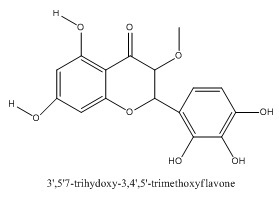 Sunitha K, Ganapaty S and Das S: Flavonoids from the roots of Polygonum viscosum Buch- Ham. Nat Prod Chem Res 2015, 3: 6. Datta BK, Datta SK, Chowdhury MM, Khan TH, Kundu JK, Rashid MA, Nahar L and Sarker SD: Analgesic, anti-inflammatory and CNS depressant activities of ses-quiterpenes and a flavonoid glycoside from Polygonum viscosum. Pharmazie 2003; 59: 222-225. Alam MB, Sajid I, Rashid Z, Islam MM and Karmaker BK: (Evaluation of Antitumor Effects of the Aerial Parts of Polygonum viscosum Global Journal of Pharmacology 2014; 8(1): 47-52. Mahmood A, Mahbub NB, Hossain S, Raisa Z and Dash PR: Phytochemistry and pharmacological importance of Polygonum viscosum: A review. Int J Pharmacognosy 2019; 6(1): 1-05. doi link: http://dx.doi.org/10.13040/IJPSR.0975-8232.IJP.6(1).1-05. This Journal licensed under a Creative Commons Attribution-Non-commercial-Share Alike 3.0 Unported License. Authors Address: Department of Pharmacy, Jahangirnagar University, Savar, Dhaka, Bangladesh.